Although the weather was terrible there was a good roll up at the Back to the Regiment. We saw a few new members and were able to catch up with some old friends. Our thanks to the Commanding Officer and the staff for once again hosting us at the Depot. We are steadily working on a new format for the production and delivery of the newsletter in order to provide a greater amount of information whilst reducing the ever increasing cost of the postage. The last newsletter was sent via e-mail to those members who had supplied their e-mail address. Others received their newsletter by post. We are very keen to increase the use of e-mail so it would be greatly appreciated if members who receive this newsletter by post BUT HAVE an e-mail address, please advise us. Additionally we are working on establishing a web site. It would contain membership forms, invitations, 12 months copies of the newsletters, articles on the history of QUR, and many more interesting pieces of information. When we add a new newsletter to the site you would be receive an e-mail giving you the link to the web. All you have to do is click on the web address and you will be taken to the website and you can choose to read or print the newsletter. Obviously we will continue posting newsletters to those without an e-mail address. The next function in which the QURA will be involved is Anzac Day. You are all invited to attend the Dawn Service and to return to the Depot for breakfast. The Commanding Officer has also issued an invitation to all ex-officers to attend the Regimental Dinner (8 May 2004). See his column for details. We are ordering more QURA ties and they will be available at the Anzac Day breakfast. We will also have coat pins. Paul Smith and Barry Schmidt have been continuing the work of producing more of the history of QUR and now have produced a CD of old historical photos. It is anticipated that the CD will be available on Anzac Day at a cost of $10 per CD. There are hundreds of photos on the CD. It has been produced as a timed photo sequence with subtitles. We are very keen to increase the photo history of QUR and would be pleased to gain access to old photos that can be scanned onto CD. The photos will be returned immediately to the owner. We would greatly appreciate anyone permitting us to borrow old photos so we can continue our collection. Please contact me or Paul Smith. I am quite prepared to pick up the photos and return them personally to ensure their security. Earlier in the year the Association presented book prizes to the top cadet and the most improved for the year 2003. These prizes are for the work completed at the Regiment in Brisbane and not the work completed at RMC Duntroon. Work completed at RMC is recognized separately by RMC. We are delighted that Paul De Jersey, Chief Justice for Queensland has accepted an invitation to attend the Annual General Meeting Friday 17 September 2004 at the United Services Club. Paul has been invited to talk about his time in the Regiment. Please write these into your diary. The role of QUR is to provide officers ready to serve the part-time army in Queensland. Like the quote, I and my staff take this role seriously and aim to produce the best officers we can to lead the army into the future. It seems only yesterday that I assumed command of the Regiment yet the year has flown by. It's been a very busy few months since December as we have conducted many courses and sent our senior cadets away to RMC for their final modules. It really was grand as the CO for so many of our cadets to achieve success at RMC. It is a fitting achievement for both them and my staff for the hard work they have put in. Cadets coming from interstate to attend our 3A modules attested to our reputation for being the hardest and best training establishment. The harsh conditions at Wide Bay in early February certainly made it hard for all involved but during my visit they all were in high spirits and gaining skills at an intense pace. It really is great to see the commitment and dedication of our young and not so young people as they undertake officer training. Many of our graduates go on to transfer to the full-time army and serve alongside their fellow RMC graduates. The dedication of the staff within the unit can be seen by the large numbers who routinely are now surpassing 70 days service each year. It is a sign of the large workloads of the Reserve and the increasing part we play in supporting the full-time Army. It is also a sign of how hard it is to get and keep talented SNCO’s and Officers. The increasingdemand of Reservists' civilian careers means that we are routinely undermanned and must beg or borrow people to help our courses. QUR took the Townsville based RMC company under command in October. We have now bedded down the relationship and it is providing synergies for all. There is no word on what will happen with Darwin. We hope to achieve a decision over the Regiment’s long term home this year but there are a lot of other things happening in the wider army that may preclude this. Anzac Day is fast approaching and we will hold the usual ceremony at the Toowong Monument in Sylvan Road. With large numbers invited back to the regiment for a fine breakfast this event reinforces our place in the local community. It is a great time to catch up with members of the Unit and Association before the main march in Brisbane. The Regimental Dinner will be held on the 8th May (Mother’s Day weekend) and the venue will return to Cromwell College and the Officers Mess at the Regiment. It promises to be a great night. Invitations are in the process of being sent out so if one doesn't arrive for whatever reason and you would like to attend, please drop us a line and we'll add you to the list. We are currently involved in the selection boards to get our new crop of staff cadets for our July intake. In-service applicants are processed through APA and have a much higher success rate at the course and generally come back to their parent unit. So for all the CO's and OC's out there, please consider your unit's future and nominate your best people. Thank you for the privilege and the opportunity to address this gathering among old friends in a familiar and comfortable environment. As the founding secretary I share with Sam Harrison the quiet satisfaction of having watched the Association grow from the fledgling that we worked to create 20 years ago in 1983. When Garry Chandler asked me would I consider speaking, I must confess that I did comment that the Association must be desperate for a speaker as this is the second time in 10 years that I have been asked. I’m sure that is not true – so here’s hoping I can spin a good yarn. It has been quoted to me more than once during my time as an Army Chaplain that the church and its people often cannot rationalise or understand the logic behind the church engaging in providing Chaplains to serve in the Defence Force. My challenge this evening is to tell the story of the mission of the church in this context - the praxis of the church's mission among the sailors, soldiers, and airmen and women – in the environment of war and conflict. And to illustrate – very briefly – through my own and others experiences. Let me set the scene with a personal reflection. I have always remembered a particular Anzac day from when I was at school in Toowoomba in the 1960s – the years before the Vietnam War; when Anzac day rolled around that year the whole school was assembled class by class for the annual observance and Rembrance. However, I am quite sure that what happened on that particular day branded itself on the mind of ever last person in my school as it surely did on me; for on that particular day, the guest speaker was a veteran of the WWII European campaign who quietly walked to the lectern and began to tell us about some of his experiences during the war. Not the usual discourse about war or sacrifice or freedom or bravery; just a vivid, anecdotal account of some actual events that had happened to this particular man during the worst of the fighting. He spoke of some of the buildings that he had assisted to blow up, some of the German soldiers he had seen killed, something of the innocent men and women and children who had been caught in harm’s way, and some of his friends who had been cut to ribbons or blown to smithereens before his eyes. He wanted us to see what his eyes had seen. The human cries that his ears had heard; what he and others had done. And the assembly was so quiet you could hear yourself breathe. Then, he finished his account and just stood there, head bowed, holding on to the lectern almost as if he was afraid of falling over. And then he started to weep. It was the first time I remember seeing a grown man cry. He did not try to hold back the tears; and of course, it was real. Great, heaving sobs poured out of him for almost a minute. I remember holding my breath for him the whole time. When he finished sobbing, he looked back up again, looked at all of out young faces and said, “Killing is wrong! War is wrong! What happened to me and my comrades and the people we killed should never happen ever again to anyone!” And then he walked silently back to his seat. When one has seen the impact of war on the human soul one could never naively say, as the United States naval chaplain Howell Forgey, who during the attack on pearl harbour in 1942 said “praise the lord and pass the ammunition”. The men and women of the ADF live with the knowledge that their training is dangerous and that there is a possibility of a deployment to a conflict some where in the world at short notice. These are the men and women who the Defence Chaplains are called to serve. Hugh Mackay described the younger generation as disengaging; disengaging from dealing with the big issues. The church, through the Chaplains, connects with the Defence Force, institutionally and individually in an attempt to meet a plethora of moral, spiritual and personal issues. While service men and women are not all religious in the traditional sense, in my experience, there is most often, a usually unspoken understanding of a belief system and sense of morality. During most military deployments - on exercise or on operations beyond Australia's borders - there is a likelihood of serious injury or death. The church has a privileged ministry of presence in standing alongside and serving with and among the members of the ADF. The focus of religious ministry and pastoral care is not primarily on the politics and global issues of war and conflict but rather the individual conflicts of conscience and faith that each member faces. Questions of spirituality or the place of God in the event or events are a question that is always present. Often the mere presence of the chaplain in the workplace (wherever that may be with the Navy Army or RAAF) – that ministry of presence – leads to many opportunities to build spiritual bridges, guide people on journeys of faith or simply listen or provide guidance through uncertainty. There are many anecdotal accounts that chaplains tell when servicemen have turned their mind to spiritual matters – to questions of faith. (Kampong Thom story). In recent history - since Vietnam - chaplains have accompanied Australian forces on humanitarian missions, peacekeeping and peace-making missions to Namibia, Rwanda, the Gulf, Kuwait, Cambodia, Somalia, the Solomon Islands, Papua New Guinea, Bougainville and East Timor. Today there are chaplains at sea and in the Solomon Islands, Kuwait, Iraq and East Timor. "God, I'm not much into religion, as you know, and I'm not sure what I should say, but this is a bloody awful turn of events. We don’t know why our mates are dead, or where you where when it happened. We don’t blame you, God, but we do ask you to take care of them now because they were two great guys. You will also need to take care of their families because they will be stuffed. Amen." "Heavenly father, you may not remember me but I used to go to Sunday School but I sort of got too busy for religion, but we really need your help now. This accident has really gotten to us and we are pretty ratshit. We don’t know what to say to each other, we haven’t got anyone to blame. Some of us are pretty angry and some of us cannot understand why it was … and … who were killed and not us. We feel pretty depressed and pissed off. We need a bit of a shake up and a kick in the arse to keep us squared away - so please be with us now and the other guys in our company who haven’t heard the news yet. Amen." The incarnational role of the chaplain in these situations was to give these soldiers the opportunity to express their raw spirituality during the immediate intimacy of their crisis and to aid them through the process of their grief and recovery. In operational trauma, spiritual and eternal issues are very real components of the process and must not be withheld when sought. At the same time the chaplain must be very cautious not to attempt to convince people in the immediacy of trauma that God is there supporting them, but rather to allow them to name their pain and emptiness and even express their anger at God. Let me speak briefly about the chaplains. The privilege of serving God in this ministry – of engaging with those involved in this environment has its price and there is a personal cost. So - this is the environment into which the chaplains are called to connect through the religious ministry of the church– to bring the hope of the glory of god. - The good news that despite seemingly incomprehensible suffering and man’s in humanity to man, there is the love of a God and there is hope. - A confrontational message so opposed to much that occurs in this world. The presentation concluded with a practical and personal reflection of Defence Chaplaincy at work in East Timor: body exhumations of victims of crimes against humanity. Len served with QUR as Company Commander, and 2IC of the Regiment while a student in Theology. He was a stalwart of the Regiment, and its traditions as an Infantry Battalion organization, before his Ordination and consequent transfer to the Chaplain's Department. Association members are invited to attend the service and the subsequent Gunfire Breakfast at Walcott Street. Members of the Regiment and members of the public will be invited and this is an excellent opportunity to renew acquaintance. Both the QUR Association and the Toowong RSL contribute to the costs of the Breakfast so please come along. The QUR Association was saddened to learn of the death recently of Dr August "Gus" Gehrmann. Dr Gehrmann was the first Commanding Officer of the Regiment when it made the post-WWII change from sub-unit to fully fledged Unit. He was awarded the Distinguished Service Order for his command of the rearguard demolition forces in the retreat from Benghazi, and was wounded at El Alamein. He retired from the Army as a Lieutenant Colonel and Colonel Commandant of the Royal Australian Engineers in Northern Command. He graduated with Honours in Engineering from UQ in 1934 and maintained a long affiliation with the University. He was the Deputy Chancellor of the University and Chairman of the Board of Trustees of Brisbane Girls Grammar. He was installed as a Companion of the British Empire in 1986 for his services to education. 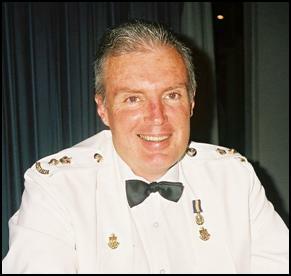 A grandson, Richard, is a lecturer at the University of Southern Queensland and serves with the Intelligence Corps in the Army Reserve. Annual Camp 1949. 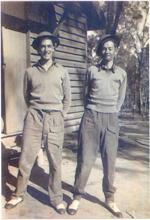 Alex Freeleagus (left) and Sam Harrison (right) at Wacol. Is this a new order of dress …. Steel helmet and sandshoes?